SINGAPORE - For the past three years, investment banker Andy has been plagued by nightmares due to stress from 14-hour work days. Three weeks ago, he decided to quit. "Work affected my mental and physical health so much, it was just not worth it," said Andy, 29, who declined to give his full name as he is serving his notice of resignation. His case is not uncommon, say doctors and human resource experts. More young professionals are ending up with medical problems, including insomnia, depression and hypertension, because of extra-long work hours. After seeing more of his patients between their 20s and 30s suffering from depression, general practitioner Quek Koh Choon highlighted the issue in a letter published in The Straits Times Forum page last month. Dr Quek, who has been running his own clinic in Bedok for the past 30 years, said many of them work as teachers, bankers and engineers. This is in contrast to a decade ago, when most of his patients with depression were the elderly who felt lost and lonely after retiring. A check with three psychiatrists revealed that up to 90 per cent of their patients are grappling with mental health issues caused by stress from work. Dr Lim Boon Leng, a psychiatrist at Gleneagles Medical Centre, said burnout from work should not be taken lightly. "It can deteriorate to full blown depressive or anxiety disorders, with severe symptoms such as feelings of hopelessness and suicidal thoughts," he said. 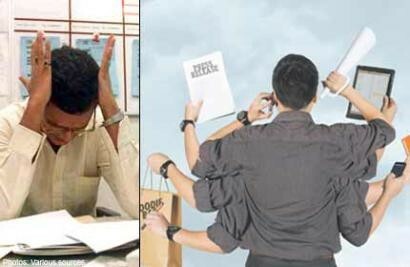 Human resource experts say some of the stress comes from the strong desire of young professionals to prove themselves. However, the problem has been exacerbated in recent years because of the manpower crunch. Fewer staff means workers end up with more responsibilities, said Mr David Leong, managing director of recruitment firm People Worldwide. In recent years, the number of workers approaching him for help to look for less stressful jobs has grown by around 10 per cent year-on-year. Benjamin, an auditor at one of the bigger accounting firms here, puts in at least 12 hours a day, six days a week. He said his company has a "work-round-the-clock" culture and labour laws do not protect managers and executives from having to put in excessive hours. The Employment Act states that blue-collar workers cannot work more than 12 hours a day, but managers and executives are not covered. Singapore Human Resources Institute president Erman Tan said bosses can help their employees work smarter with better delegation of tasks and clearer instructions and by focusing on results instead of "face time". The answer, for some, may be to switch jobs. But it is not an easy decision. Andy said he struggled with the decision to quit his job at a foreign bank for a year and is now thinking of working as a property agent or a teacher. "It was difficult because I will have to give up a $10,000 monthly salary. But for now, I think having more time for myself and my family is more important."